The NBA Finals are alive and well after LeBron James and Kyrie Irving sparked a critical Game 3 win over the Warriors. 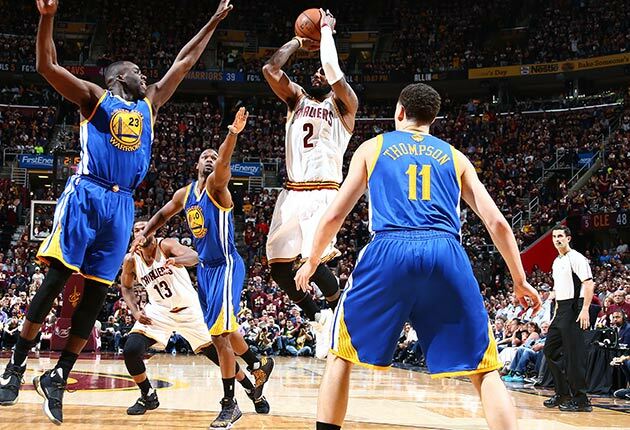 There is life in these NBA Finals, sparked by Cleveland’s complete reset. Going home did the Cavs good. The details lost in the shuffle of their first two games in Oakland rang through with perfect clarity, from the most basic elements of offensive execution to the nuances of full-speed defensive communication. It took just a few minutes for the Cavs to establish themselves as the team they intended to be in this series—one with only passing resemblance to the disorganized group that ceded the first two games of the series without much trouble. The renewed Cavs were unmistakably present. No Golden State possession went by without multiple Cleveland defenders playing up and into the passing lanes. Players who had faded into the background of the Cavs’ iso–heavy offense were brought front and center by deliberate, targeted offense. It took two full games for Cleveland to conduct its business with the appropriate punch. Though overdue, that team-wide vigor translated into a massive 120-90 win in a game that could have otherwise brought the Cavs’ season to its functional end. So much changes in this series when Cleveland’s best players are able to collapse Golden State’s defense and force actual, extended rotations. The Warriors switched so seamlessly through Games 1 and 2 as to present a gapless front in coverage. On Wednesday night, Kyrie Irving (30 points) and LeBron James (32 points, 11 rebounds and six assists) compromised it—at times by more cleanly (and quickly) attacking in isolation, and at others by orchestrating an offense with actual, productive movement. Attacking Stephen Curry was a consistent theme in either case. Irving began by running the reigning MVP through enough pick-and-rolls, back cuts, and isos to force a matchup adjustment. Curry then proceeded to lose track of J.R. Smith in his extended haze, allowing one of Cleveland’s most capable role players to establish his place in this series. So it went for Curry all night, offense included. Curry has seemed untouchable for most of this season—able to shoot from depths beyond those a defense can reach and clever in leveraging that skill to create new angles of attack. Even when his box score contributions were muted in this series, the simple influence of Curry’s movements could break a defense’s principles. Game 3 saw something else entirely: a performance so poor, so clumsy, and so oblivious that it could have hardly come in more radical contrast. Golden State can win this series with Curry producing modestly. What it can’t endure is extended minutes of him playing carelessly, as was often the case in Game 3. Curry’s 19 points on 6-of-13 shooting don’t even come close to capturing the vacancy of his performance. Irving deserves credit for frustrating Curry away from the ball, as do the variety of Cavs who switched into that same responsibility. That denial, coupled with aggressive play in the passing lanes, drained any fluidity from the Warriors’ offense. No longer was Golden State swinging the ball through and around the defense into easy scores. Even the Warriors’ more productive trips were often the product of a mad scramble following a deflection or a rushed shot to bail out a stalled set. Warriors coach Steve Kerr, too, did his team no favors in the second half by continuing to play traditional lineups with either Andrew Bogut or Anderson Varejao on the floor. Difficult as it may be to sustain the effort (and rebounding) necessary for the Warriors to run small for entire games at a time, the considerable advantage of those lineups has been established too clearly to ignore. Conspicuously absent in the night’s proceedings was Kevin Love, who was ruled out by the NBA’s concussion protocol. Love’s considerable skills don’t have any comfortable place in this series; the matchup manages to both neutralize what he does well offensively while exacerbating what he does poorly defensively. It’s not entirely a surprise that Cleveland fared well without him in Game 3, even if he is clearly one of the team’s three best players on balance. Such is life in the NBA. Excepting a tiny class of superstars, every other player in the league comes across competitive environments that don’t suit them. Such is true of Love and a seven-game gauntlet against the Warriors—a fact which complicates the dynamics of his return. Love should still play if healthy, but his minutes and role must be carefully managed for the Cavs to keep balanced. Cleveland, after two games of flailing about, has finally met the bar. The energy level shifted and the final product transformed. The Cavs’ collective focus sharpened and their mistakes fell away. James was sensational, Irving electric, and the likes of Smith (20 points) and Tristan Thompson (14 points, 13 rebounds) essential. On Friday, the same trial begins again with no less than the fate of their season in the balance and no less than the best team in NBA history working against them.